Matthew Gabriele offered an excellent suggestion in my post below: to learn more about horses being cursed, learn whether or not horses were blessed. After a quick search I discovered, first, that I need to get myself to a library if I want to answer the question, and second, I discovered the original of the holy hand grenade. You there, yes you, you with the 20-sided die, you may be doubtful, but you will now know that I am right. 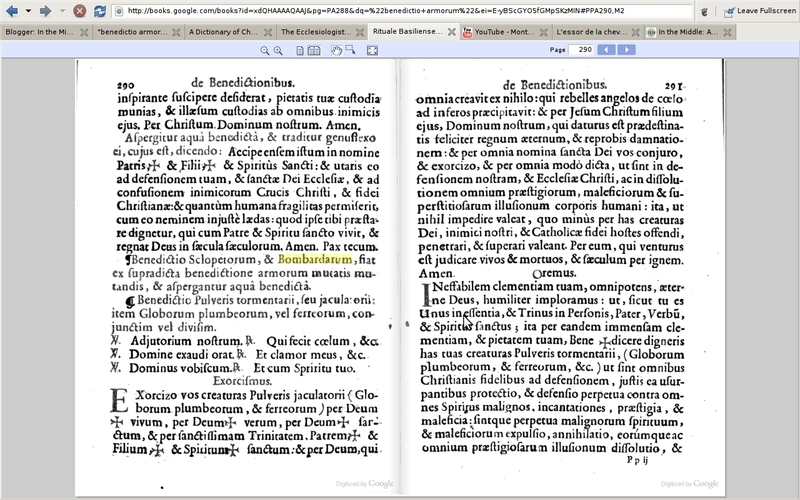 Benedictio Sclopetorum, & Bombardarum, fiat ex supradicta benedictione armorum mutatis mutandis, & aspergantur aqua benedicta. Benedictio Pulveris tormentarii, seu jaculatorii; item Globorum plumbeorum, vel ferreorum, conjunctim vel divisim. Bless the rifle and cannonball, and let the above blessing of the arms [be done] with all the appropriate changes, and let them be sprinkled with holy water. Let the gunpowder [?] be blessed, and the projectiles: namely, the bullets, whether of lead or iron, whether collectively or individually. Thank you. Isn't there a Medieval Academy Prize for meritorious [I spelled that right I hope] service to Geekdom? This has started me thinking: is the reason why philosophy makes a separate place for animals because philosophers (unlike everyone else, including knights, shepherds, hunters, aristocrats, even) have less acquaintance with animals? I mean, Jerome has a lion, but that's an imaginary pet. This is big, you shall take your place alongside whoever figured out that the vicious Rabbit of Caerbannog had its antecedent in the Roman de Renart. (That rabbit's dynamite). oh yes, and Karl: I hope there is an ITM prize for the most amazing research discovery of the year. I nominate you, for the origins of the Holy Grenade of Antioch. Please, JJC? Can we have a medieval Oscar ceremony? Like, at one of the GWU Early Mo/ME Center meetings? I can make the statuette (I think it should be a gold Tiny). Actually, I think it should be a Golden Fez. on a little pedestal, with a plaque? Karl, this is soooo excellent ... I don't know how to express it! I was thinking this would be a brilliant Pseudo Society presentation at Kalamazoo, but then I thought: wait! But it's actually true! An amazing discovery, to be sure! And yes, "pulveris tormentarii" is indeed gunpowder. The term is found in e.g. both Bacon's Novum Organum (I:CX) and Newton's Principia (Def. V). Karl, long after you are dead, it is for this discovery that future medievalists will be remembering you in awe. The Holy Hand Grenade needs a patron saint, Karl, and you should be it. Thanks folks! I know there's got to be some actual scholarly work on this, and if there's not, well, someone has to write a study of Early Modern benedictio armorum: why not let it be you? Not being a regular reader, I've come here from the link at Unlocked Wordhoard, and the work on horses that Karl is doing is new to me, but by a coincidence I was talking to a colleague at dinner the other night and he is working on horses in the eighteenth and nineteenth centuries. (I can put you in touch if you think it would be helpful, Karl.) One of the things he was saying is that by and large the naming of horses only seems to start then, basically because of horse-racing becoming a sport that could win renown and a career rather than an idle recreation. He also says that it's really only then, with horses becoming a middle-class entertainment, that they start to acquire their current sort of sentimental pull on popular emotions; aristocrats don't really care much about their horses, he reckons. I did wonder whether this was protochronism, but the only named horse I can think of from the Middle Ages is Sleipnir, who is something of a special case. You folks know the literature far better than me, however: when would you say the first horses' names are known? As to the actual matter, I think the Holy Hand Grenade of the film is meant to be a riff on the Holy Lance, hence its Antiochene origin, Terry Jones pointing fun at medieval blessing of warfare. The Book of Armaments is marvellously original pastiche though, read by Palin in what became a trademark style. As to the blessing of Arms, however, a rapid stab at the web reveals this office, which is in the Pat. Lat. and which I can therefore discover comes from a 13th-century Codex in Vienna copying the Pontificalis Romanorum. So if you're looking for origins, early modern may not be far enough. A minor quibble: if I read the Latin you link to correctly, these are actually two separate blessings; the first is just an addition to a previous text saying, basically, use the previous one for this job but with appropriate changes, and then the second one for the bullets actually goes on for several paragraphs more with an actual benedictional. The capitalised bits you give are the headings, not part of the sense. You folks know the literature far better than me, however: when would you say the first horses' names are known? Alexander's Bucephalus is the first one I can think of (to be honest, my wife just reminded me of this one). In Middle English literature, there's Arondel, Bevis of Hampton's horse, and Grigolet, Gawain's horse in Sir Gawain and the Green Knight. That's not true either. You can direct your colleague to the chapter 'Chevalerie' in Jeffrey Cohen's Medieval Identity Machines, which includes some information on knights in fiction, who, having had their steeds cut out from under them, wish they'd been killed rather than their horses. there's also this story from the Gesta Treverorum: Additamentum et continuatio prima, c. 6, ed. G. Pertz, MGH SS 8. p. 180 of a bishop who gives his horse to a hungry mob to be eaten. While the horse isn't named, I think the "libet invitus" [albeit against his will] and horrific zombie-hoard-like imagery of "laniati atque devorati sunt in momento coram eo" suggests some kind of fellow-feeling for horses. Primum dedit suum, deinde aliorum non equidem omnium, sed eorum tantum quos ad hoc pietatis opus sua potuit exhortatione instigare; et laniati atque devorati sunt in momento coram eo. Post haec ad locum destinatum processit. Thanks for the note on the Latin. Yes, suspected that, since the scan indicates that the bit I quote is in red in the original. The additional blessing bit for the bullets is equally strange and hilarious: the blessing of this death-dealing object by the living God, then a kind of credo, and then the particular attention to witchcraft: "ut sint in defensionem nostram, & Ecclesiae Christi, ac in dissolutionem omnium praestigiorum, maleficiorum & superstitiosarum illusionum corporis humani"
I imagined there was a medieval version of the blessing of arms, as it didn't strike me as likely to have been invented only in the last 400 years. So thanks VERY MUCH for the PL reference. I played with this one in particular is because the references to cannons, rifles, bullets, and the like, particularly modern weapons all, sounded more like the holy hand grenade than, say, a blessing of swords &c.
Glad to have helped, if I have, and I shall pass on the references to my colleague; thankyou for them in turn. And yes, sorry, I quite got the relevance of the cite, should have made that clear. I must just have some protochronist bug now that I've learnt the word. I played with this one in particular is because the references to cannons, rifles, bullets, and the like, particularly modern weapons all, sounded more like the holy hand grenade than, say, a blessing of swords &c.
Next time I'll try writing my comment using English syntax. And thanks for "protochronist": never heard it, but I like to have a fancy substitute for the slang "trapdooring." I hadn't come across that, I admit; how's it supposed to work? The idea being that someone falls through the trapdoor before reaching what should be their ultimate goal? Protochronism, I should say (as I do in the post, but people here may not go and look), is an anthropological term I'm misusing, as they would usually use it to compare contemporary cultures, not cultures separated by time. Heck, they probably wouldn't use the word cultures any more, I'll just never catch up. But I must hat-tip to the person from whom I got it, who blogs here. The idea being that someone falls through the trapdoor before reaching what should be their ultimate goal? For those of you not in on medievalist slang, "trapdooring" is what happens when someone claims some technology, or mode of thought, or system of life (even including subjectivity itself) as an "invention" of Modernity. Along comes a medievalist (beginning I suppose with Haskins' Renaissance of the Twelfth Century) and points out, no, the "origin" of such things predates Modernity (whatever that is), sometimes by thousands of years, or, better yet, declares that origins (or beginnings or breaks) themselves are far from the most interesting topic of investigation. Hence trapdooring, as the claimant for Modernity's specialness gets dropped into the fifteenth, or twelfth, or ninth centuries, or gets dropped into an abyss where beginnings no longer matter. Thanks for the link to the Bolovian News Blog. Looks fascinating, and it's quite well-written. Bolivian. Sheesh. Very tired today. Also: for trapdoor, helps to think of it in terms of slapstick. Someone makes a claim, and they at once disappear through the trapdoor that sprang open beneath their feet. Anyone who's had a look at the mercifully brief benedictio armorum from the PL will observe that while the Early Modern blessing is good "contra omnes Spiritus malignos," blessing from the 12th-13th ms. is good only against "visibiles inimicos," and, moreover, it's only for swords [unless I misread it]. Looks as though the science of blessing must have developed in the centuries approaching our own? I'm a little fascinated by the formula for blessing that follows it in the PL: it's for pilgrims' staves and also for "capsellas," which I'm guessing are reliquaries. But why should a reliquary be brought on pilgrimage? Am I misreading this? I think you're reading it correctly, and I think again to the First Crusade where I believe there were a good many relics taken (and of course even more brought back), and certainly of course relics taken into battle, most obviously that Lance again. I would have to admit I don't really have my head round that but I'd chance a suggestion that both in battle and on pilgrimage they were being taken along for safety and protection, like sanctifiable amulets. That definitional post is really interesting too. I need to make more time for posts here, if I can do it without starting fights as has happened before.